This modern casino style bench combines both comfort and style. 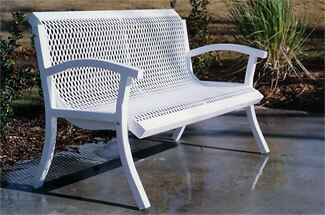 The seat is made from 3/4" # 9 expanded metal, and is finished with lightly textured matte Polyethylene color coat. The arms are 12 gauge 1-1/2" galvanized steel tubing and powder-coated to perfection. 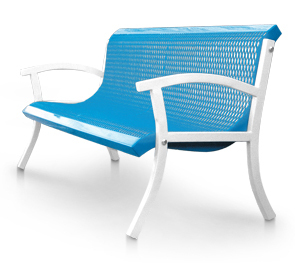 The thermoplastic coated seat and powder-coated frame	provide excellent weather resistant finishes.